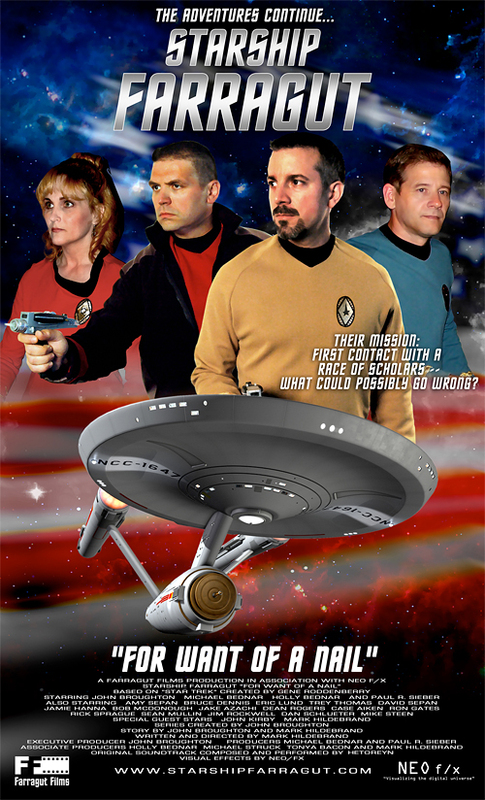 To date, Starship Farragut has released four full-length episodes, three short vignettes, two animated episodes (yes, you read that right), and one comic book (you read that right, too). And it’s still going strong! But where and when did Starship Farragut come from, and just how did the team navigate all those pesky torpedoes to go full speed – even warp speed – ahead? John Broughton as Captain Jack Carter of the USS Farragut. The answers begin in November of 2004 when a (fairly) young U.S. Navy veteran who was working as a marketing director for a government contractor in the Washington, DC area came up with an idea. John Broughton was a serious Trek fan who loved TOS. By 2004, John had seen the pilot episodes of both Star Trek: New Voyages and Starship Exeter. But it was the latter that really inspired him. If one group of fans could make a Trek series about a starship other than the Enterprise, why couldn’t another group of fan do the same thing with yet another starship? After all, the U.S. Navy was full of ships with different captains and different crews. And thus was the dream of Starship Farragut born, and along with it, the desire to turn that dream into a reality. But dream and desire are endlessly easy. The torpedoes usually hit when you get to design and determination. But as it turns out, John had plenty of both. And he also had another not-so-secret weapon: supportive friends and family who were ready and willing to help. In countless interviews that he’s given, John has pointed to his team as the real reason for Starship Farragut’s success. “It’s not The John Broughton Show,” he says often. I could easily fill up multiple blog entries just talking about everyone involved with their pilot episode “The Captaincy” because nearly five dozen people helped to make it possible… including John’s own wife and father, plus various husbands and wives, siblings, parents, children. Everyone pitched in. John himself had to learn to sew to make the costumes. 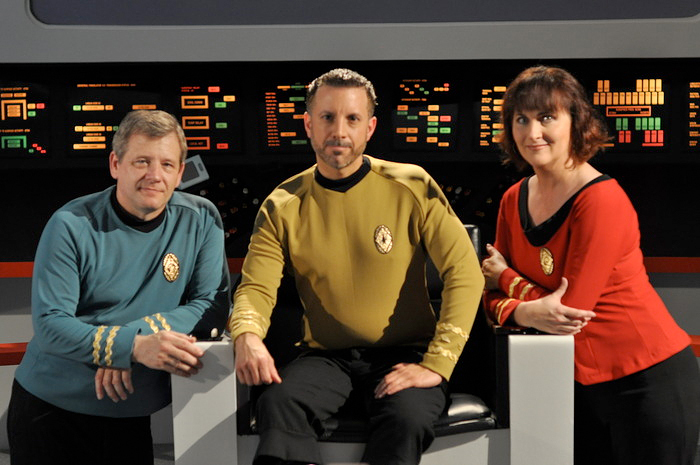 His dad helped to build sets and even appeared as a Starfleet Commodore in the episode. Most of the funding for the 83-minute long pilot came from John’s savings account, which was pretty well tapped after purchasing a $5,000 camera, lights, and sound equipment, not to mention paying for materials to construct sets. Team members pitched in where they could, donating countless hours of their spare time – and the occasional gift card to Lowe’s – to make John’s dream (now their dream, too) into a reality. John himself starred in the pilot as Captain John “Jack” Carter of the USS Farragut. John based his character on one of his heroes: President John “Jack” F. Kennedy…along with drawing on some of John’s own experiences both from serving in the military and also managing in a business environment. He then asked his best friend Michael Bednar to appear, as well, possibly as a Chief Engineer named Mike “Smitty” Smithfield. Michael declined, opting instead to just help build props. Michael was a serious prop collector… and those he couldn’t get screen-used from actual sci-fi TV shows and movies, well, he’d just make them himself! So, yeah, Michael was happy to work in the prop department. Michael’s wife Holly, however, was the executive director of a community theater in the Washington, DC area and was happy to play a character. So she became Chief Engineer Michelle “Mike” Smithfield and as well as casting director (a job she still does more than a decade later). Smithfield and Captain Carter had gone to the Academy together, and although Carter outranked her, Smithfield still saw him as a “little brother” of sorts… and as someone who was just “borrowing” her ship to go play star-hopping explorer/cowboy. It made for a fascinating dynamic. Michael Bednar, John Broughton, and Holly Bednar, the “big three” of Starship Farragut. Oh, did I say Michael Bednar wasn’t going play a character? Silly me! Mike ultimately changed his mind and took the role of Carter’s Exec and Chief Science Officer, Robert “RT” Tacket. Mike still plays the character ten years later (as does his wife play her character), and is still prop director. 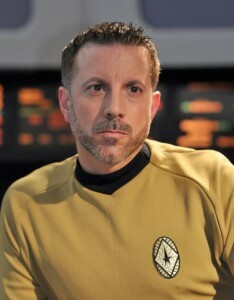 Although Commander Tacket would hold the same position on the Farragut as Spock did on the Enterprise, there was a very different feel to RT’s character. Tacket and Smithfield had been romantically involved in their past (very unlike Spock and McCoy!) and like his Chief Engineer, Carter’s First Officer also served a little like a mentor to his Captain, the voice of age and wisdom. In this way, the “big three” of Starship Farragut were very distinctive and compelling characters… and the series would make it a point to highlight that we weren’t simply watching Kirk, Spock, and McCoy on the different starship. 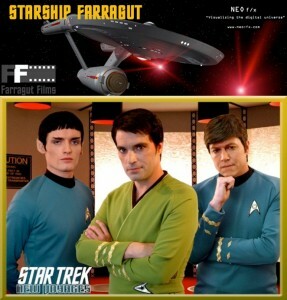 Two big pieces of the Starship Farragut puzzle: NEO f/x and Star Trek: New Voyages. Other cost savings happened through the use of outdoor locations to simulate an alien planet, specifically Accokeek, MD and nearby Mason Neck State park, which cut down the expense of building more sets. And to save money making expensive Klingon costumes, John Broughton brought in a dozen local area Klingon fans from Maryland and Pennsylvania who already had their own uniforms. John was also able to get original music composed by John Seguin (and mastered by Dave Cebrowski) to give their series a rich, full, and original feeling. 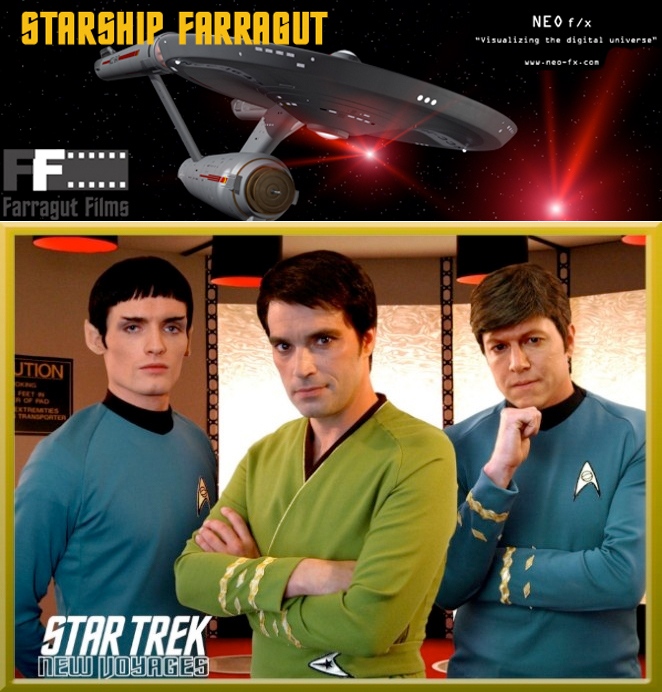 The combination of the professional music with the authentic-looking New Voyages sets and the eye-catching VFX from NEO f/x immediately rocketed Starship Farragut to the top tier of Star Trek fan series at the time its pilot episode debuted at the Farpoint Convention in Maryland in February of 2007 (and on the Internet a week later). 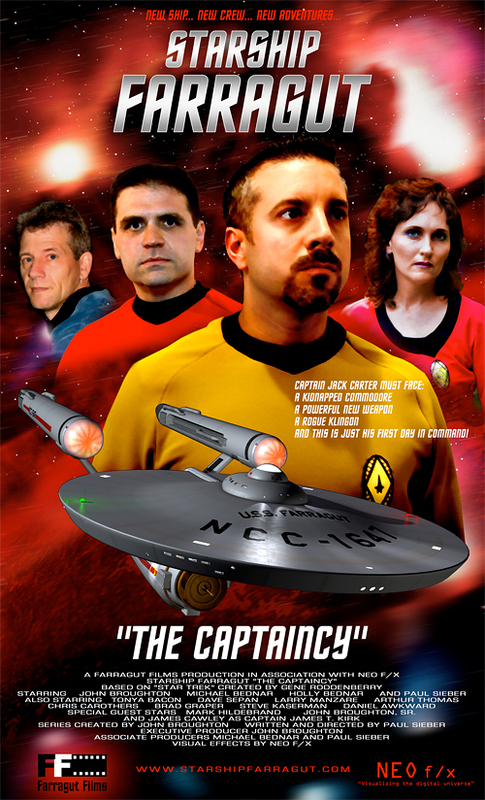 Starship Farragut’s second episode…a stunning and award-winning triumph. Filled with momentum, this team didn’t waste any time getting a second full-length episode completed. In fact, “For Want of a Nail” actually began filming in November of 2006, three months before the release of Farragut’s pilot episode, and wrapped on filming in July of 2007. And nearly all that effort for those eight months of production happened during long weekends when people didn’t have to be working at their day jobs! Another few months of postproduction later, and Farragut’s 64-minute long second episode premiered in mid-October…barely eight months after the pilot episode. With such a long run time, one might expect the episode to feel a little slow and boring. But surprisingly, the episode is actually quite engaging, thanks in large part to Mark Hildebrand, who plays a very compelling General George Washington in a time travel story, half of which takes place during the American War for Independence. Mark had also worked on the pilot episode as an associate producer and appeared as one of the Klingons, but his involvement with the second episode was much more significant. Working off of a plot synopsis from John Broughton, Mark wrote the screenplay (his first ever), produced and directed the episode, edited both the video and sound, and helped design sets. And Mark continued to work on Farragut even after the second episode was completed. 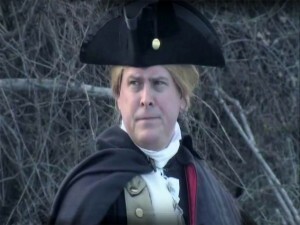 Mark Hildebrand: writer, director, actor, editor, set designer, and father of our country. The episode worked on many levels. Once again, Farragut Films used James Cawley’s TOS sets at Retro Studios in upstate New York to film scenes on the USS Farragut itself. But for the scenes which took place in earth’s past, the production took advantage of a very unique resource local to the southern Maryland area: Mount Calvert Historical & Archaeological Park, which included many pristine, preserved colonial homes dating back to the eighteenth century. Mark himself had been a Revolutionary War re-enactor back in high school and college, and he had friends who were still involved in the hobby. This translated into tailor-made casting of performers with tailor-made costumes they already owned who portrayed soldiers and townsfolk of that time-period. As such, the scenes in the past with General Washington and his men seemed as authentic and believable as the scenes in the future on board the USS Farragut. The script, along with allowing development of Captain Carter, First Officer Tacket, and Engineer Smithfield, gave attention to the character of Security Chief Prescott, played by Paul R. Sieber (who had played the same character in the pilot, along with also writing and directing it). 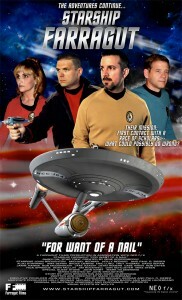 Prescott’s character provided a unique look at a red shirt who wasn’t just put on camera to be killed off. Prescott’s no-nonsense military toughness played off of Captain Carter in fascinating ways. But by far, the show was stolen by the penetrating performance of Mark Hildebrand himself, portraying a wise and thoughtful General George Washington moving though a very real (and historically accurate) crisis of confidence. Once again, NEO f/x provided CGI and editing/compositing services, and many other folks who had been involved with the pilot episode continued their participation. Ads on Craigslist only served to increase the number of people involved with the production by at least a couple of dozen. One notable talent change, however, came with the arrival of musical composer Hetoreyn, who gave the episode a very haunting and engaging period flavor. And speaking of haunting, the episode had a very controversial ending involving the Mirror Universe that left many fans debating whether or not this episode should be considered “canon” (or as canonical as fan films can be). Personally, I liked the ending, and Farragut’s take is what will be in my own “head canon” until I see otherwise. “For Want of a Nail” went on to win the Best Fan Film Award at the Wrath of Con film festival in 2008. 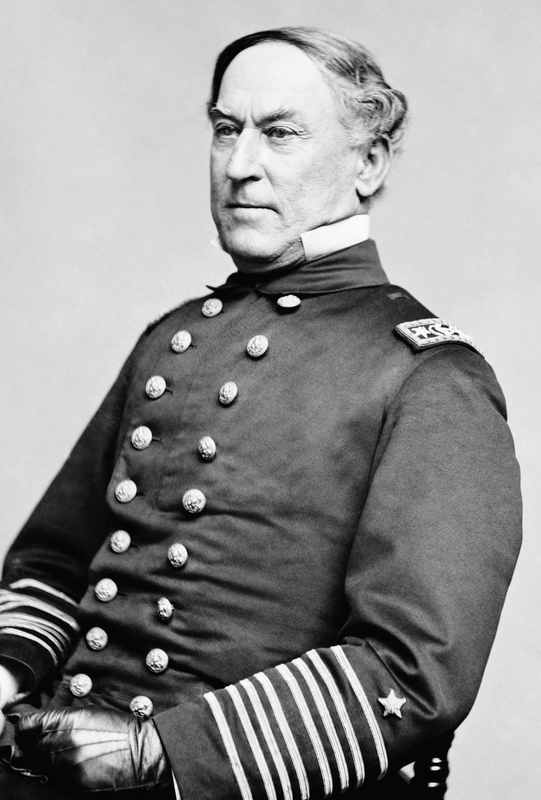 But Starship Farragut was just getting started. 2008 would bring with it huge changes and leaps forward for Starship Farragut as John Broughton and his team would rewrite their own playbook and take Farragut where no fan series had gone before. Next time: part 2 of our 3-part look at the fascinating history of this amazing fan series. 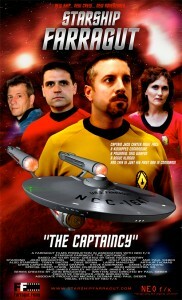 Can Starship Farragut possibly continue to release TWO films per year?? Things get quite animated as the production team looks for space (and not the final frontier kind!). And which irreplaceable member of the Farragut crew wants to be…replaced??? In the meantime, you can check out Starship Farragut’s website and Facebook page for all the episodes, background information, and endless photos. Watch “The Captaincy” by clicking here. Watch “For Want of a Nail” by clicking here.